Solar and Lunar eclipses are caused when the light of Sun is restricted in reaching either Earth or Moon. The mathematics of eclipses is presented in this article about how eclipses happen and what Rahu and Ketu have to do with the orbit of Moon around the Earth intersecting with Earth’s orbit around Sun. In short, during eclipses, both the nodes are conjunct with both the luminaries. During Solar eclipse, Sun and Moon are conjunct to a degree along with Rahu or Ketu. The closeness of the nodes with the luminaries causes problems in the life of the individual born around an eclipse. In my observation, a good chart, even with raja yogas, panchamahapurusha yogas is destroyed if born during an eclipse. The effect is seen in a general reduction of the quality of care coming from mother and father and may extend to negatively affect on other planets that are caught up in the eclipse axis. This post is not concerned with rituals to be undertaken during eclipses and the effect on the individuals with various rashi/nakshatra. This post is also not about the mundane astrological effects of the eclipses. This post is only about the effect of a grahan yoga on a horoscope. These are shadowy planets with shadowy qualities. Rahu is more feared generally because of being considered a cheater in our mythology. Rahu is treacherous and deceitful and cannot be trusted. There is always double-dealing involved. Rahu is also ambitious and is capable of getting what is required by hook or by crook. Ketu is opposite of Rahu in terms of ambition. It is complete lack of attraction and signifies aversion. Ketu, therefore, signifies sanyasayoga as it takes the individual away from worldly desires. In the horoscope, Ketu has the effect of burning away of the interest and desires associated with the house where it is located. As the two important planets in the horoscope, Sun and Moon signify the soul and mind. They are the significators of father and mother respectively who provide right environment and nourishment when we are growing up. Moon is more afraid of Rahu than Ketu. Association of Moon with Rahu causes diseases of hallucinations and schizophrenia as it has the property of deceit and making up things that do not exist. Ketu with Moon is detachment from worldly affairs. It can cause depression, which can be managed better than the diseases of the mind. The quality of relationship with mother goes down quite a lot. Ketu makes the person grow apart from mother, but at least there will be formal relations and a modicum of decency is maintained. Sun does well with Rahu. Rahu accentuates the qualities of Sun (although in a negative way) and creates more egotistical behaviour. It is a good yoga for success in administration and politics. Ketu with Sun is problematic as Sun does not know how not to shine. Father doesn’t know how to connect with the person and help in progress. Type of Eclipse: During Solar eclipse, Moon is conjunct Sun and is “burnt” in a way. Moon becomes malefic due to extreme closeness to Sun, as during amavasya day. Lunar eclipses are better that way for Moon. Which shadowy planet is with Sun and Moon: Rahu with Moon will cause more problems. Ketu with Sun will cause more problems. Planets caught in this axis: Note down the planets in the axis. Their natural karakatva and house lordships should be noted down. House lordships of Sun and Moon: While natural karakatva of Sun and Moon are well known, their house lordships will also be important. The axis of operation of the nodes, e.g., 1/7, 2/8 should be taken into account. In this horoscope of a child born during a lunar eclipse, Moon is lord of Lagna and Sun is lord of the 2nd house. Therefore, apart from mother and father, a negative effect to self/health, family and to the ability to save money should be predicted. Mercury is on the axis and is very close to Ketu, in its debilitation sign. Sun is also about 4° away from Ketu and since Sun represents the 2nd house in this horoscope, both the karakas of early education and speech are negatively affected. This is exactly what is happening unfortunately with this child. Moon is close to Rahu and is negatively affecting mind and learning abilities. Jupiter is in the lagna, seemingly in exaltation, but the exaltation is diminished due to retrogression. It will not be able to give positivity to the chart. Also, The debilitation of Mercury is also not likely to be cancelled because it’s lord is deemed to be getting uchcha-bhanga. There are some good points in the chart. Mars’ location in 10th house is indicative or Ruchaka Yoga. 10th and 11th lord together in 10th indicates dhana yoga. Ashtakavarga scores reinforce this point as 11th house score is higher than the 10th house and both of these scores are higher than 12th house score. Therefore, within the limitations of the horoscope, this child should do well. If the parents take him to a good doctor and involve in speech therapy, there will be an improvement in his condition. Rahu, a malefic is sitting in the 3rd house in a friendly sign. Therefore, there are some positives in the chart indeed. General remedies include strengthening of Sun and Moon, along with the lagna lord. Also, Rahu/Ketu shanti path is required. Mantras are more important than gemstones especially because there are more number of planets involved. Also, if the problem is understood during childhood, there there is very little scope for the kid to wear so many gemstones together. Hence, mantras are more practical. In this above case, the same remedies for strengthening Sun and Moon were suggested. 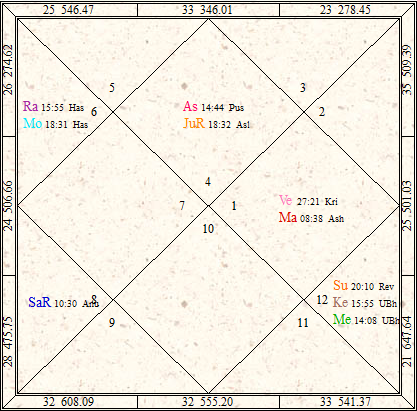 Since Jupiter as 9th house is in Lagna and is aspecting Mercury and Ketu closely, it was suggested to increase the powers of Jupiter to control the malefic aspect of Ketu. It was advised that religious setting be maintained at home and that a child get a religious guru. Mercury needs to be strengthened through eating and donating whole mung. The parents could donate school items to young students. my date of birth is 08/08/1994.what is my grahana yoga.i born at kurnool.